PYE's annual “Catch the Fire” Training on Whidbey Island Gives Tools for Fostering Creativity and Innovation to Teachers, Youth Workers, Trainers, and Changemakers. A 2015 Catch the Fire participant, a trainer from Mexico, shares her learning during a group meeting. With the right tools and framework, anyone can transform their classroom, program, or group into a thriving creative community. The research is clear: Creativity and innovation are the keys to vibrant classrooms, engaging programs, and effective teams. Yet there’s little guidance for leaders wanting to put creativity into practice. 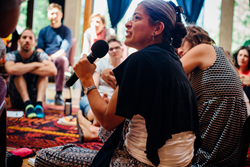 At their third annual Catch the Fire Training, June 20-24th at The Whidbey Institute, Seattle-based nonprofit Partners for Youth Empowerment (PYE Global) promises to provide just that. Recent research by Google backs up the training's premise. The years-long study, Project Aristotle, determined that psychological safety, a key component of PYE’s approach to creativity, is crucial to high-performing teams. Catch the Fire Training is led by a multi-cultural team of facilitators including PYE’s Taylor, who has a Masters of Education in Creative Arts in Learning and taught creativity at Bainbridge Graduate Institute. An author, musician, and social entrepreneur, she has trained thousands worldwide to enrich their work with creative facilitation techniques and arts-inspired practices. Diversity is a cornerstone of the Catch the Fire experience, with attendees ranging from locals to globetrotters. Openings remain in this year’s training, and scholarships are available. Those interested in registering or learning more can visit pyecatchthefire.org.